Here's Wybie! Revised, updated and improved pattern plus video tutorial ~ 2014. 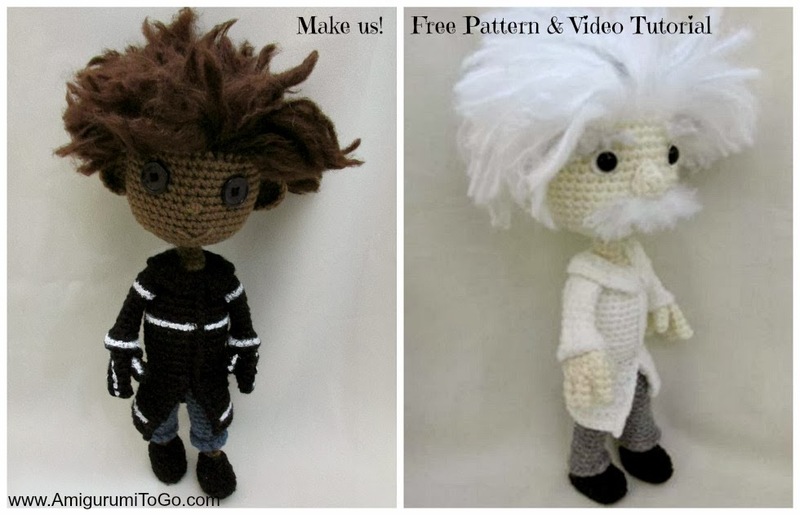 I had lots of fun revising this doll and because Wybie's colors are so dark I had to use lighter colors while filming the tutorial and in the process I ended up making an Einstein doll.. It was that crazy hair! So Einstein pictured above is the exact same pattern as Wybie aside from the facial hair and the big nose. By the way, the mustache is rooted in the same way I rooted in the hair! I put in 2 rows then frizzed it out, same for the eyebrows (1 row) . Special notes: I worked in continuous rounds with a 3.75mm hook and worsted weight yarn. Have any questions or if you come across a mistake in the pattern please leave a message in the comment section below. 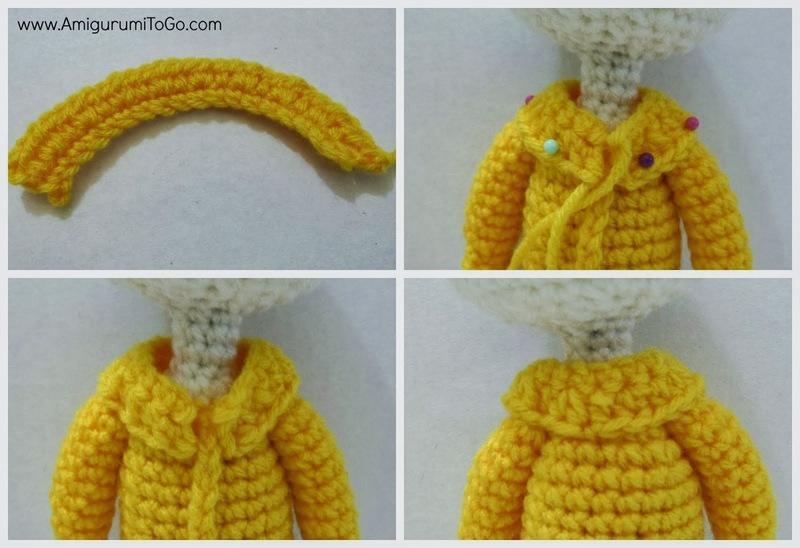 This pattern will give you a doll about 8 1/2 inches tall depending on your choice of yarn and hook size. *stop and stuff head. Stuff the head as much as you can, making sure to shape as you stuff. Use a pencil or stuffing stick and make a hole in the stuffing, right in the middle. This hole is for the pipe cleaners you will put in later. *now stop and stabilize the neck. For this I cut a piece of 20 gauge wire about 24 inches long (2 times the length of a pipe cleaner). I folded it in half then folded it in half again and twisted it as pictured. The 20 gauge wire is optional but it does make the neck super stabilized yet still poseable. Don't worry if you don't have the wire as the pipe cleaners will work on their own just fine. 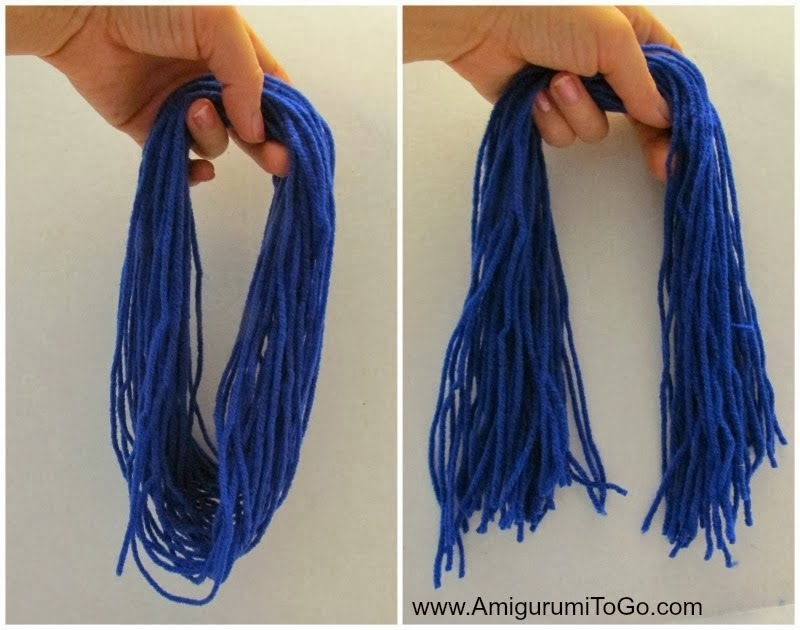 Take 4 pipe cleaners and fold them in half and twist them around the wire. Put in a pencil or stuffing stick inside the head and work it around to re-open that hole you made earlier in the stuffing! This step just makes it easier to push the stabilizer in. Push the wire into the neck making sure you go far enough in so that the other end is level with row 39. Take the piece out, taking mental note of the area that sits inside the neck itself and add a thin layer of fabric glue (tacky glue will work too) just to the part that sits in the neck. This step will ensure that the stabilizer will not come out of the neck later. Let the glue dry for a minute or two then continue onto row 40. I used pictures from another doll tutorial to explain some parts as we go along. By crocheting in the front loops for row 43 you created a ridge on the inside as pictured below. This is where you insert the color you will use for the pants. 2+) Crochet 2tog until you close the gap, if you can't crochet 2tog until the gap is completely closed just stop when you can't work the 2tog anymore and with a yarn needle and the yarn tail weave in and out of the remaining stitches then pull tight, knot off and hide yarn tail inside the body. Make sure to add in any stuffing the body needs before closing up the gap completely. sl st next st then f/o leaving a tail for stuffing into the front of the shoe. 18) 2tog twice then f/o using the yarn tail and a yarn needle, weave in and out of the remaining stitches then pull tight to close up the gap. 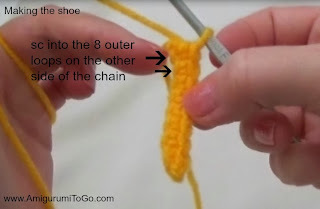 Knot off and hide yarn tail inside leg. *begin with a long starting tail that you will use later to sew the leg in and also to sew the pants to the body. If you made the pants that roll up; roll up the bottom of the pant to where the ridge is made from crocheting in the FLO on row 16. The pants should naturally stay rolled up at that ridge but you can add in a stitch to hold them in place if needed. Push the ball of the leg into the shoe. It should sit in the shoe w/o stitches but you can put in a couple stitches if you think they are needed. Hide yarn tail inside foot. Push the leg into the pant piece. Using the yarn tail from the pant, sew the top of the leg to the top of the pant. Once you have both legs assembled, pin them in place on the body to assure the proper placement. Once you are happy with how they are positioned sew them in place. *Sew the arms and the front strips of the coat in place after you paint on the skeleton hands and the stripes around the coat. You can use fabric paint but I just used regular white craft paint. 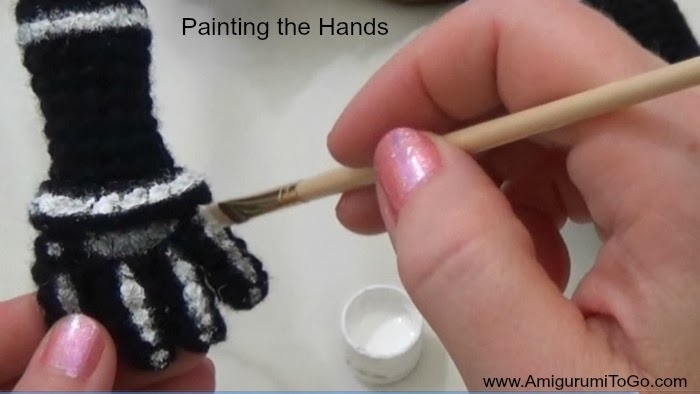 Use a stiff craft brush. It will take between 2 and 3 coats of paint. Let the paint dry in between coats. Do not start at one end and paint around to meet up where you started because it will not join up evenly. Instead start the paint in the middle in 2 and work towards the back, having the 2 starting points meet up in the back. Refer to video if this part is confusing. After the paint is dry, go around with a small pair of scissors and cut off any fibers that are sticking up. start with a long yarn tail and leave a long yarn tail once you f/o for sewing. You can sew or glue these strips in. I found it faster and easier to glue them on. strip one: chain about 25. 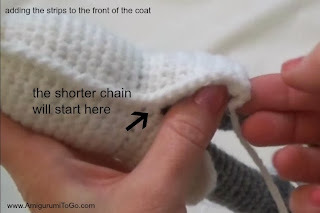 The top of the chain goes in at the top of the coat just at the color change and the bottom of the chain will wrap under the coat. strip two: chain about 13. The top will meet up where the coat opens up and the bottom will wrap under the coat. f/o leaving a long tail for sewing. Pin into place as pictured then sew around the bottom edge of the collar. f/o leaving a long tail for sewing. Shape ears then pin in place. Make sure you are happy with the placements before sewing them in. The top of the ear sits just under the 4th row down from the color change on the head and the bottom of the ear sits just above the 8th row down from the color change. Wrap a good size bundle of yarn loosely around your hand as pictured then cut through the middle at the bottom of the loops. Root each strand of yarn in each st around every row starting at the color change on the head. Once you are done, turn doll upside down and cut the hair. Cutting the yarn this way gives the hair layers which works very well for this style. Don't cut too short! It's better to cut too little and have to cut again then to cut too much. The picture below titled, "The Haircut" is the length that works best. Now you can brush the yarn out... brush, brush, brush then brush some more! You want the yarn to be completely frizzed out. Once it's all frizzed out then cut out little bits here and there to thin out the hair ~> See the video tutorial for this part as it is easier to show than explain in written form. When you are ready to style the hair I found it helped to dip my fingers in water then twist and wrap the hair into the style I wanted. 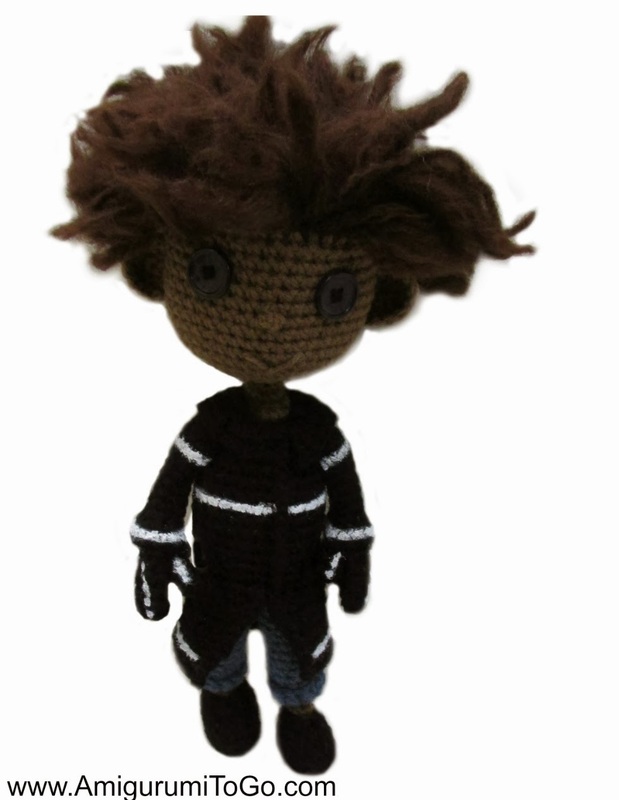 It also helps to get a picture of Wybie and use it for reference as you style the hair. For how to do the face please view Coraline's pattern right here. I put the face in using the same steps as I did in Coraline's. 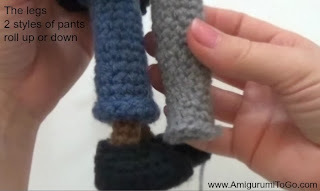 The video tutorial covers this part of the pattern too! Oh I can't wait to try this, I have to make something for my grand daughter and I think he will be next. Thank you so very much for sharing your work. This is amazing. Thank you for sharing such detailed information. I am looking to learn how to design crochet sculptures and this is a great help. Thank you Marina, I'm glad you are finding the videos helpful. I don't have a tutorial on how I wrap my yarn but next video I will try and remember to show how I hold my yarn. I actually have been asked that before. Keep an eye on my youtube channel and I will hopefully get a new video up soon. I'm watching your channel on Youtube for a long time and I'm impressed! When I saw Einstein I thought that I HAVE to do it for my husband. Thank you very much for sharing this video and the description on the website. Thanks to you I spend last evenings creating Einstein and having a great joy. I have a question concerning his nose. I can't design it so to come out perfect. Would you be so kind and wrote how to do his nose? I am so excited to have discovered your blog! My daughter is currently obsessed with Monster High (we have heaps!!!) but she has always had a soft spot for "Coraline"! We started watching the movie when she was 5 and she absolutely LOVES it! These beautiful creations of yours are so adorable, and I am anxious to start creating them so that she can have a tangible collection of the Coraline movie! Awesome, awesome work! And such detail! Congratulations on a brilliant job! Could someone help me find the video tutorial please? Is there a link somewhere? Ooops sorry it was right there! Everything else is right so that's probably why it didn't trip them up.. I updated the pattern and the video. Don't hesitate to write again if there's any other questions. I love your work, it's magic ^_^, I'm doing the Einstein doll but I don't know how do the nose, in this tutorial you explain how do the nose like the Wybie and Coraline, but the Einstein nose is triangular, can you explain me how do that or maybe tell me if in other tutorial you explain that to find that? Thanks a lot! Love the Einstein one! Did you ever write the pattern for him? 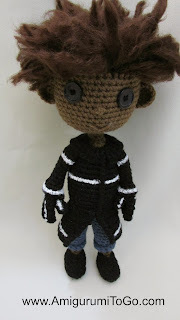 not his official pattern but you can make the one you see just by following wybie's pattern. His mustache and eyebrows are rooted and brushed the same way the hair is. pouvez-vous me dire quelle taille fait Einstein fini ? Je tiens à vous remercier pour vos tutos très instructifs et je ne manquerais pas de vous faire un petit virement dès que mes moyens le permettrons car je n'ai pas beaucoup de ressources.. I'm left hanging with a partial face for einstein. I got the whole doll made and there I am with no nose, eyebrows or mustache. Your video just stopped. Can u out help me out here? read the introduction at the top of this pattern page. I talked about that but there is no nose pattern, you could add wybie's nose though and it would look fine.